Dr. Saluja is fellowship-trained in hip and knee reconstruction with emphasis on custom-matched joint replacements and complex reconstructions of the hip and knee. He completed his fellowship training with Dr. William L. Bargar who is a pioneer in the field of robotic hip surgery and the use of custom hip prostheses. An avid athlete, Dr. Saluja enjoys tennis, biking and running and has completed over twenty marathons. 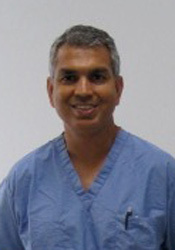 Click here for a list of Dr. Saluja's Publications and Presentations.